Ayodele Fayose, Governor of Ekiti State, on Wednesday shed tears on national TV, continuously wailing “I am in pains”, “I am in severe pains”. The outgoing Governor cried when speaking with Channels Television, saying he was in pains after he was “shot at” and manhandled by security agents. Fayose then broke into tears, lamenting “I cannot take this anymore” before crawling away from the camera. Those tears came minutes after he addressed a crowd of PDP supporters, appearing in bandages on his right arm and a neck brace. “I call on the international; community; Ekiti is under siege,” he had said. “How can I be Governor of Ekiti State and be treated like this in my own country? My people, I call on all of you: stand and remain standing. Earlier, Lere Olayinka, spokesman of the Governor, had said his principal lost consciousness and was taken to Government House clinic after policemen fired teargas canisters into the Government House. Olusola Kolapo, Fayose’s deputy and the Ekiti State Peoples Democratic Party (PDP) governorship aspirant, had also said earlier that he was assaulted in his shoulder region by the policemen while his boss was also beaten. 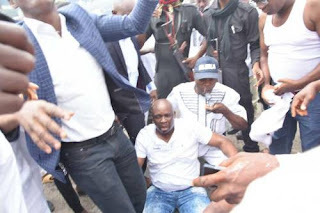 Although SaharaReporters confirmed that mobile policemen fired teargas canisters to break up a PDP road rally for its candidate in Saturday’s election, it has yet to verify claims the Governor was shot.